There are few automakers doing business in the US who are growing as rapidly as Hyundai so it came as no huge surprise when the Korean automaker opted to launch the 2013 Hyundai Elantra GT - a 5-door version of the uber popular sedan that will help the Elantra continue to climb the charts of the most popular cars in the US while also helping Hyundai to continue their steady growth in North America. Due to the stigma against “station wagons” that developed in the US through the 1980s and 1990s, there are very few cars that offer the cargo hauling capabilities of the 2013 Elantra GT. This stigma accounts for the lack of competition for this affordable family truckster and it also accounts for the fact that you don’t see the words “station” or “wagon” anywhere in the vehicle description but at the end of the day - the Elantra GT is what Americans 20 years ago would have called a station wagon. Fortunately, the Elantra GT is engineered in such a manner that it avoids the aspects that caused the negative reputation for “wagons” here in the US. It is as fuel efficient and as nimble as the rest of the Elantra lineup while offering tons of cargo space for objects of all sizes. It also avoids being so tragically unhip as the old school soccer mom wagons of the 1980s that drove so many people away from 5-door cars. Of course, in the modern age of the automobile, we wouldn’t expect that any company would roll out a new model that mimicked the downsides of the old station wagons but what comes as an even bigger surprise is the fact that the Elantra GT is quite a bit of fun to drive. 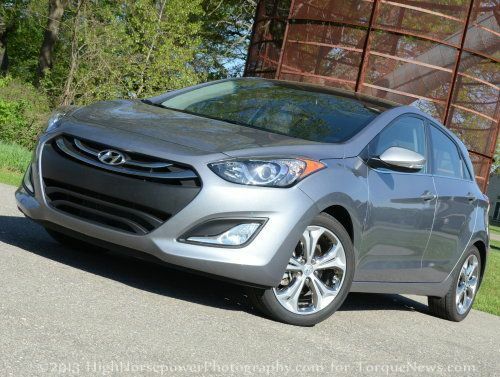 My test subject for this review was the 2013 Hyundai Elantra GT in Titanium Gray shown throughout this article. Options included the Style Package, which adds 17” alloy wheels, the sport suspension setup, the gorgeous panoramic sunroof, leather seats, a leather wrapped steering wheel, aluminum pedals and more. The total price of the test vehicle was $22,015. The only options not included that are available come as part of the Tech Package that adds navigation, automatic headlights, a backup camera system, dual zone climate and push button start. While with a quick glance, the 2013 Hyundai Elantra GT looks very similar to the sedan on which it is based, Hyundai has added a variety of styling cues all around that help it to carry a bit more sporty, aggressive countenance than the 4-door version while also packing some features that allow the GT to look a touch more upscale. However, these changes between the sedan and the 5-door GT are subtle enough that there is no question that they are essentially the “same car”. The 2013 Elantra GT is a 5-door hatchback so it should be obvious that the biggest changes from the sedan come out back, where the back end is completely redesigned. In addition to the hatch, the GT rear end has its own unique lower fascia sculpting and taillights that are smaller and slightly more aggressive than the sedan’s rear blinkers. Even though there is plenty of space on the “liftgate”, the license plate has been moved down to the lower fascia area with large, red reflectors that are not present on the sedan mounted on both sides. The rear hatch also wears a low profile spoiler that adds that little extra bit of sporty appeal to the rump of this compact 5-door. Like the sedan, the exhaust system is tucked up under the lower fascia, nearly out of sight for a nice clean look. Overall, while more aggressive than the sedan, the rear end of the Elantra GT is less fluid than the 4-door models with unique hard lines being created by the large rear opening. Along the sides, the 2013 Hyundai Elantra GT very closely follows the design of the sedan with the only major difference being the obvious change in the profile caused by the elongated rear roofline of the hatchback design. Like the sedan, the roofline is very fluid from front to back with a hard body line running through the doors and into the taillights but the extra greenhouse space has allowed Hyundai to add an extra, smaller quarter window just behind the rear doors that add just a touch more visibility for the driver when attempting to change lanes on the highway or back out of the driveway. The front end of the 2013 Hyundai Elantra GT has received the most distinct yet subtle revisions compared to the sedan. The headlights and grille are a similar shape on both versions but the GT packs HID projection headlights and a much sportier grille filler featuring a blacked out center section for that extra sporty appeal. The grille opening above the black center section is larger than that found on the sedan while the lower portion of the GT front end has downward angled bars that give it a more aggressive look than the upward angled bars on the sedan. This Elantra is frowning because it’s an aggressive model – it is a GT, after all. Finally, the lower front fascia of the GT has fog lights that sit in the same relative location as the sedan but on the 5-door, these extra lights are set in a contrasting housing rather than the molded units of the 4-door Elantra. Shy of the fact that the 2013 Elantra GT is a hatchback rather than a sedan, the changes between the 4-door and 5-door models are subtle enough to allow the two vehicles to share a name yet distinct enough to allow the GT to be more than just a hatchback version of the Elantra sedan. Honestly, I prefer the look of the Elantra GT in every way and I would expect that those buyers who are looking for something with a little attitude will feel the same way that I do. On the inside, the 2013 Hyundai Elantra GT follows a similar design pattern to the outside with some features that are borrowed from the sedan and some features that are unique to the 5-door GT. Of course, the elongated roofline of the hatchback design allows for increased headroom for rear riding passengers along with increased cargo space when the back seats are folded down. I expected that the GT would have a larger cargo area with the rear seats in the locked and upright position but surprisingly, the “trunk” area – as it would be – is smaller on the GT than on the sedan. However, once you fold the rear seats down, the Elantra GT will allow you to pack in as much stuff as a small SUV or crossover. In addition to offering an abundance of rear headroom, the 2013 Elantra GT provides an impressive amount of space for rear passengers in terms of elbow room (with two passengers in the back) as well as leg room. In fact, with the front seats adjusted to comfortably seat a 6 foot tall driver and passenger – there is enough leg room for a pair of adults of similar height to sit comfortably in the back seats. It might be a little tight on a 10 hour ride to Vegas but for four adults heading to dinner or something – the Elantra GT can keep everyone comfy. Also, the roomy front area of the cabin affords the driver and passenger with a ton of hip, head and leg room with a solid range of seat adjustability allowing both very tall and very short drivers to be able to drive the GT safely and comfortably. Elbow room, however, is a little tight with both the driver and front passenger forced to fight over a fairly small armrest. The Elantra GT is comfortable thanks to all of the interior space but with leather seats and a spread of gloss black and matte silver trim around the cabin, it is also great looking. The heated front seats feature power adjustments on the driver’s side along with fairly deep hip and side bolsters (but not enough of a bolster to make a larger driver or passenger uncomfortable). My Elantra GT test car was fitted with the standard stereo and HVAC controls – both of which are unique in their layout from the controls in the sedan version. The Elantra GT has lots of buttons on the center stack to control the heated seats, the defrosters, the climate controls, the radio and the phone system but that isnt a bad thing. I would venture to guess that those drivers who prefer a traditional button and knob layout will vastly prefer this design over the touch screen setups featured on many new compact cars in America as this system is very simple to use and very straightforward – no learning curve to make the AC or the radio work in the Elantra GT. Finally, the Elantra GT shares the steering wheel design with the sedan, where you will find a collection of buttons to control the sound system, the cruise control and the hands free phone system without removing your hands from the wheel. Beyond that leather wrapped steering wheel is the same gauge cluster with a prominent tachometer and speedometer flanking the driver information center and the fuel gauge. One of my favorite aspects of the 2013 Hyundai Elantra GT is the massive panoramic sunroof that comes as part of the Style Package. This glass roof treatment looks great whether it is open or closed with a sunshade helping to keep you cool on hot days and a huge opening when the top is maneuvered back on milder days. I’m a fan of panoramic sunroofs and on the long roofline of the Elantra GT – this huge sunroof is a grand slam. While the improvements made to the interior of the 2013 Hyundai Elantra GT are minimal in some ways, with a collection of more basic features such as a radio with buttons and knobs, there really isnt much that you find yourself wanting while you are driving the GT. This is an incredibly well appointed vehicle throughout the cabin – especially when you consider the fact that my test car was only $22,015 with $2,845 dollars in options and a $775 destination fee. The 2013 Hyundai Elantra GT is powered by a 1.8L 4-cylinder engine that sends 148 horsepower and 131lb-ft of torque to the front wheels via a 6-speed manual transmission while offering fuel economy figures of 26 miles per gallon around town, 37 on the highway and a combined figure of 30mpg. Hyundai has run into some troubles lately with heavy footed drivers complaining that they are unable to achieve the EPA fuel economy estimates but during my time driving the Elantra GT, I found those figures to be very realistic. Over the course of my testing time in the GT, I averaged closer to 31 miles per gallon with a mix of roughly 60% highway driving to 40% city driving and while cruising on the highway, I found that 37mpg highway number to be very easily achievable. It should be noted that in averaging close to 31mpg, by no means was I driving to intentionally get better fuel economy. I drive every vehicle the same way and even with quite a bit of spirited driving around town - the Elantra GT exceeding the fuel economy figures that I was expecting. In many cases, Americans will associate the “GT” moniker with a sport package such as the Ford Mustang GT or the new Dodge Dart GT so it might seem confusing to some US shoppers to see a fuel efficient 5-door model labeled as a GT. While the Elantra GT doesn’t pack the driving excitement of those two models mentioned above, Hyundai has done a great job designing the Elantra GT to pack a surprising level of “fun to drive” factor without killing the sensibility of this roomy compact. The power figures might seem a bit low but thanks to the lightweight architecture, the quick revving engine and the standard manual transmission - the Elantra GT is far more fun to drive than you would ever expect. The throttle is quick and readily responsive and with a touch of aggressive clutch work, the Elantra GT will both spin the tires on launch and offer up a little tire chirping fun during the lower gear shifts. The clutch is very user friendly and the shift pattern is tight - what many would consider to be a sportier feature as you quickly and easily row through the gears. While you don’t get the same level of acceleration as you would from the Veloster Turbo, the Elantra GT adds just enough driving fun to allow it to stand apart from many of the less enticing options in the segment. This isn’t a car that is going to tear up the drag racing scene but for someone who wants an efficient compact with lots of cargo space but who still wants to be able to enjoy the drive - the Elantra GT packs more sporty personality than you would expect. Another area where the 2013 Hyundai Elantra GT excels is handling and ride quality. Whether you are cruising on the highway or cutting through tight back country roads, the Elantra GT offers a very smooth, quiet ride but it does so in a manner that doesn’t kill the handling capabilities. Many modern cars offer either a nice, smooth ride or acute handling but thanks to the drive selectable steering system - the Elantra GT offers something for everyone. The driver can select between Comfort, Normal and Sport steering modes and while each of these settings offers varying levels of steering aggressiveness, none of them kill the ride quality for either the driver or the passengers. Because of this, I spent the majority of my drive time in Sport mode where the GT offers more acute steering that - dare I say - mimics the feel of far sportier vehicle. When cutting through sharp back country roads, the Elantra GT is surprinsgly responsive and nimble with minimal body roll. In fact, you have to basically throw the GT into a turn with the intention of overpowering the suspension system in order to get this car out of its comfort zone so someone who enjoys driving (especially in tight, twisty areas) will almost surely enjoy driving the Elantra GT…and that is something that no one ever said about the station wagons of the olden days. Ultimately, I would bet that a great many prospective buyers who are looking at the 2013 Hyundai Elantra GT are less concerned with acceleration and acute handling capabilities than they are efficiency and the ability to get from point a to point b safely but for those drivers who want a car that can fit lots of cargo, lots of people and still offer some fun to drive factor - the Elantra GT is a great option. You might not care about how hard you can hit the turns without under steer or how much you can spin the tires in the Elantra GT but for younger buyers who want a car that can do all of the things expected from a C segment 5-door while also being comfortable in situations of spirited driving - the Elantra GT delivers. While there are a great many people in this country who would still scoff at the idea of driving anything that could be construed as a station wagon, the 2013 Hyundai Elantra GT fills a void caused by the anti-wagon stigma and it does so in a manner that allows it to avoid any of the downsides associated with the cars that caused said stigma. It is very fuel efficient, it handles well, it packs great acceleration and it offers cargo hauling capacities that are hard to come by in a car sold in the US. If you are in the market for a new car that will afford you the luxury of carrying as much cargo as many sport utility vehicles but still maintaining the driving characteristics and the fuel efficiency of a compact sedan - the 2013 Hyundai Elantra GT is one vehicle that you should make sure to drive before making your next vehicle purchase.